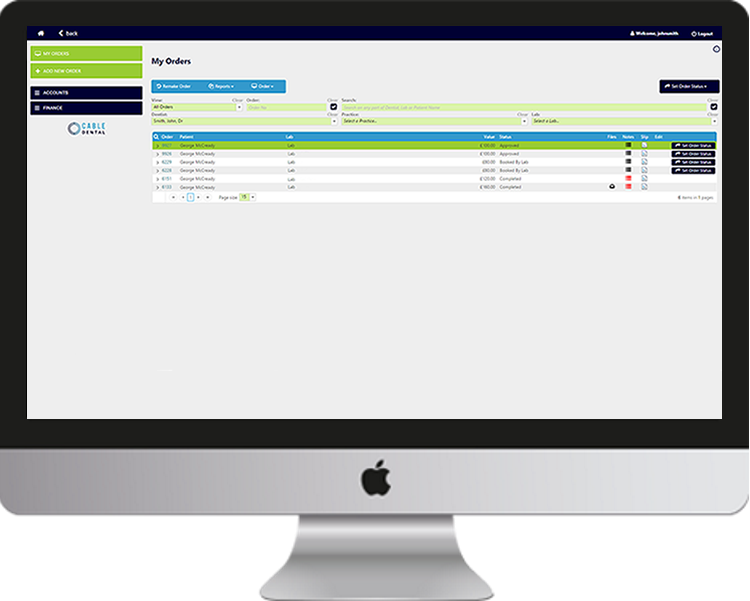 The ultimate ordering & communications cloud based system. Helping dentists and labs to work together better. CABLE doesn't cost anything to set up or use. There are no annual costs or licence fees. With so little risk, what are you waiting for? We have gone to great lengths to ensure data is stored and handled securely. CABLE uses a multi-level permission system to ensure that only authorised users may access data. “I joined the Cable Dental team as I really believe that the innovative platform they have built is going to transform the way in which the dental profession interacts with the suppliers we all rely on so heavily”. Chairman of Cable Dental’s Dental Advisory Board. Dental Surgeon, Specialist in Prosthodontics and Visiting Professor at City of London Dental School. "Before taking Cable on within the practice, I was concerned that it would add extra time to my already busy schedule but this really isn’t the case! With an introduction of anything new at the practice, I never imagined for it to be as easy and efficient as it was especially as Rob was always on hand to answer any queries I had and placing orders gets easier and easier each time with an average of less than a minute per job. One of the key benefits of having Cable at my fingertips is that I no longer have to scan in lab prescriptions as well as being able to check where my work is at any given time." "Since using Cable my life as a dentist has become much easier reducing the time spent duplicating tickets and making phone calls. Communication with the lab is made much easier. All job details, including photographs and discussions with my technician, are all in one place and best of all… everything is tracked so you’re never caught short! "It is common that when something goes wrong people have time to complain but when something nice happens no one says anything and that’s why we’re taking this time to thank the team at Cable for the aftercare support. We are really happy with the service provided and what we like the most about you guys is you continue to check on us even after training and installation to ensure all is well. This gives us the confidence that, when we are in need you will be reachable and resolve any of our concerns. Thanks Rob for the endless support, nice to know that you and your team care!"